« REMOVE CROOKED BUREAUCRATS AND YOU WOULD REMOVE BLIGH. I visit a grave-site at Woodhill cemetery regularly to have a chat and re-freshen the p.v.c. vase with real evergreens, plastic and cloth not acceptable, thank you very much. Buying flowers and specifically roses, went out the window way back, select picks from the surrounds are readily available and last until the next visit. Cathy would never tolerate bodgie plastic stuff and I oblige to this day. It’ll be a long drought after I cark it. The prime purpose of the first seven or eight year’s visits was to alleviate somehow, a dread loneliness. On special occasions, like birthdays and Christmas, I’d take a pot of proper tea, sit on one of those old concrete plots and give a progressive commentary on our chances as I rubbed-off scratchies numbers, just as we did on Christmas and birthdays past. Trimming couch grass runners before they snake over the plaque and gouging weed roots now going mental with the agreeable conditions is a little bit of fussing like flicking imaginary stuff off a partner’s clothing. You never win with weeds whether wet or dry, but that’s not news. Christmas is when busy, and perhaps slightly remorseful acquaintances find some quiet time to call on old friends and relatives. Christmas was big, big, big with Cath and started early November when the tree went up and concluded reluctantly well into the new year. 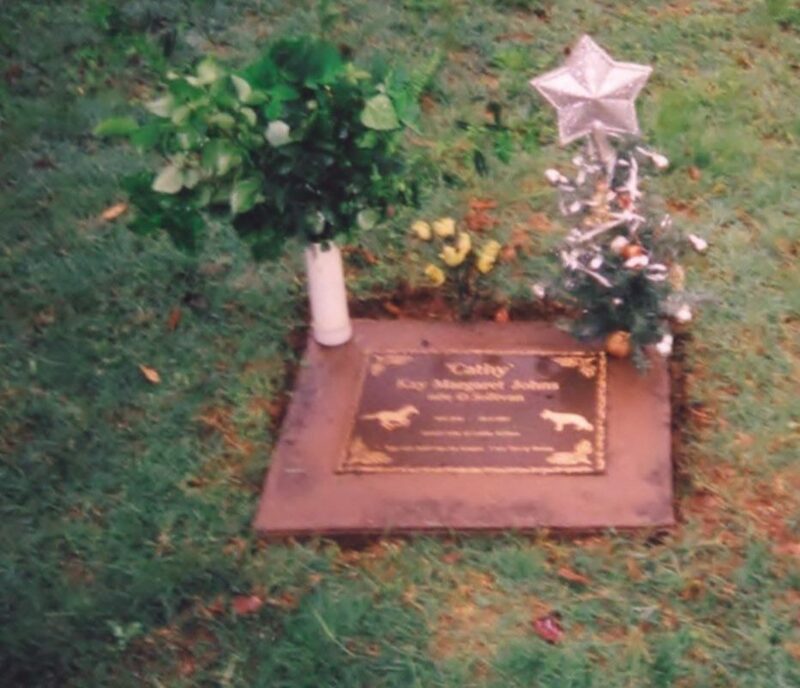 Nowadays, a day or two before the 25 th I put the top of the tree with its silver star into a plaque surround hole and place Cath’s last purchase of a plastic Santa in his sleigh, leading pairs of reindeer around the plaque and remove them much sooner than desired because of a vandal visit. A normal wet should have presented the cemetery visitor a green and soft perspective, different to the harsh Christmases of the last 13 or 14 years. Relatives and friends visiting Woodhill would have been taken aback by the subsidence and the dislodgement of plaques after the heavy rainfall. Would like to remind able-bodied people who can use a wheelbarrow and shovel, with loved ones at privately owned cemeteries like Woodhill, that all general upkeep, and that relates especially to mowing, is on a voluntary basis. The repair is not as daunting as it seems. I used a couple of $1 buckets to walk the dirt from the heap, the shovel as lever to raise the plaque level and to pack the soil under, and buggar me, I had accomplished the day’s feel-good mission in a half an hour. This is the cemetery from which a small water tank, installed for use by flower bearing visitors was stolen. Let’s assist the curator and tart-up the forlorn plots if they remain neglected for too long. This entry was posted on January 4, 2011 at 4:00 pm and is filed under It's All Relative..	You can follow any responses to this entry through the RSS 2.0 feed. You can leave a response, or trackback from your own site.